- Publisher Each year on Good Friday, Christian congregations all over the world walk the Stations of the Cross, a commemoration of Jesus walk to Calvary. This work provides a fresh resource for congregations and individuals who want to explore the meaning of these Stations more deeply. - Publisher Each year on Good Friday, Christian congregations all over the world walk the Stations of the Cross, a commemoration of Jesus' walk to Calvary. 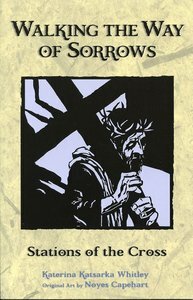 In Walking the Way of Sorrows, artist Noyes Capehart and writer/journalist Katerina Whitley provide a fresh resource for congregations and individuals who want to explore the meaning of these Stations more deeply. Capehart's stark and powerful blockcuts of the fourteen Stations are accompanied by monologues from the point of view of someone from each blockcut. These monologues, along with biblical references and a brief liturgy, are excellent for individual devotion, but can also be used by groups who walk the Stations together. About "Walking the Way of Sorrows"
Each year on Good Friday, Christian congregations all over the world walk the Stations of the Cross, a commemoration of Jesus walk to Calvary. This work provides a fresh resource for congregations and individuals who want to explore the meaning of these Stations more deeply. Each year on Good Friday, Christian congregations all over the world walk the Stations of the Cross, a commemoration of Jesus' walk to Calvary. In Walking the Way of Sorrows, artist Noyes Capehart and writer/journalist Katerina Whitley provide a fresh resource for congregations and individuals who want to explore the meaning of these Stations more deeply. Capehart's stark and powerful blockcuts of the fourteen Stations are accompanied by monologues from the point of view of someone from each blockcut. These monologues, along with biblical references and a brief liturgy, are excellent for individual devotion, but can also be used by groups who walk the Stations together. Whitley worked as a church journalist for the past two decades. She was born in Thessaloniki, Greece.